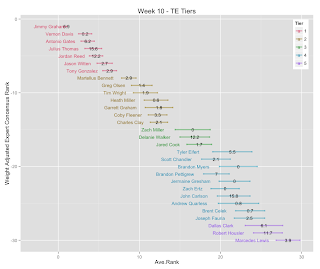 This week I added tier accuracy, as defined as the percentage of higher tiers that actually came in scoring higher than a lower tier. At a glance this seems like a nice metric that I'll keep track of going forward. 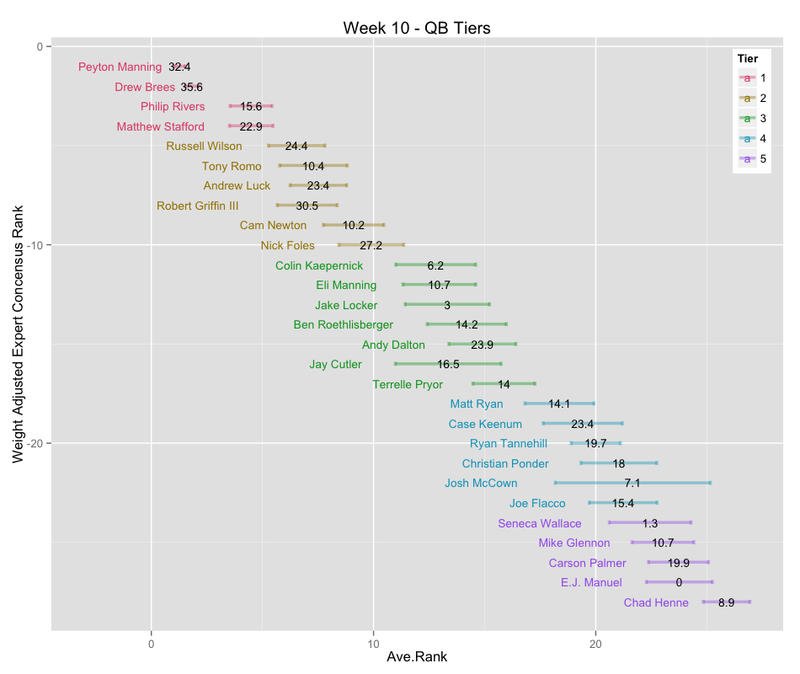 This week we have: QB 90%, RB 86.7%, WR 71.4%, TE 60%, K 33.3%, DST 50%. 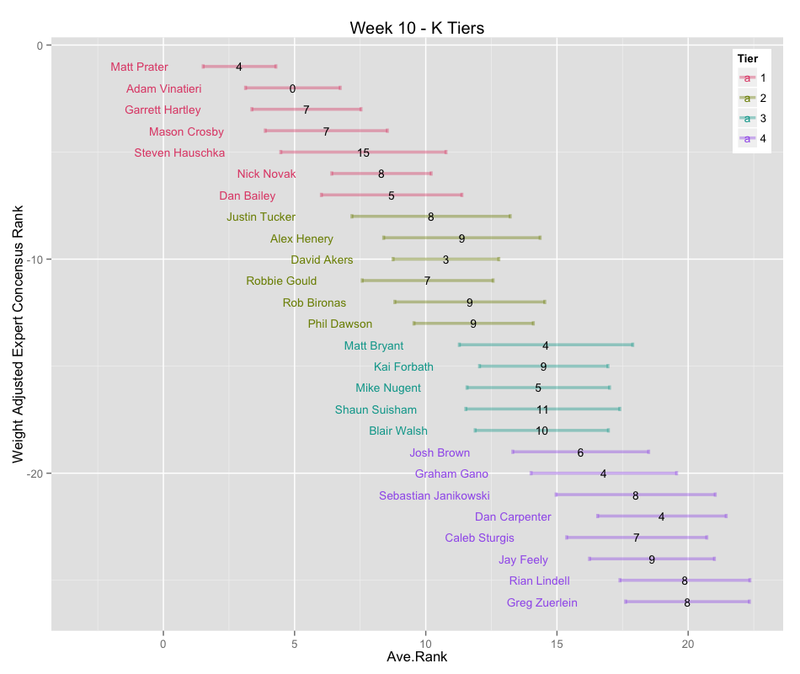 This seems consistent with past weeks -- QB/RB/WR great, TE mediocre, K/DST not so great. 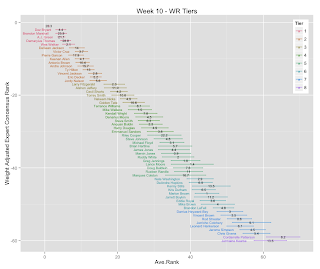 I believe WR has been higher in past weeks. - if anyone has a better source than fftoday that uses standard scoring, please let me know! It was a great week for QB's. 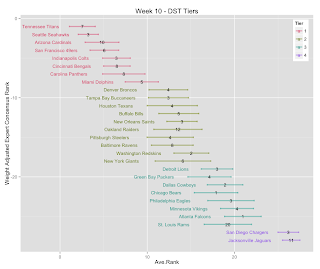 Only tiers 3 and 4 got mixed up, and not by much. 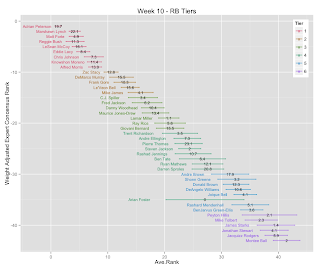 RB consistently behaves well and has been (to my naked eye of doing this since week 6) the most predictable position. 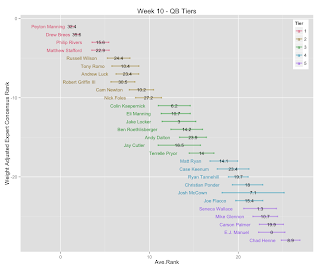 The top 3 tiers of WR each week continue to overwhelm the rest of the pack. This has been a trend since I started doing retrospectives in week 6. 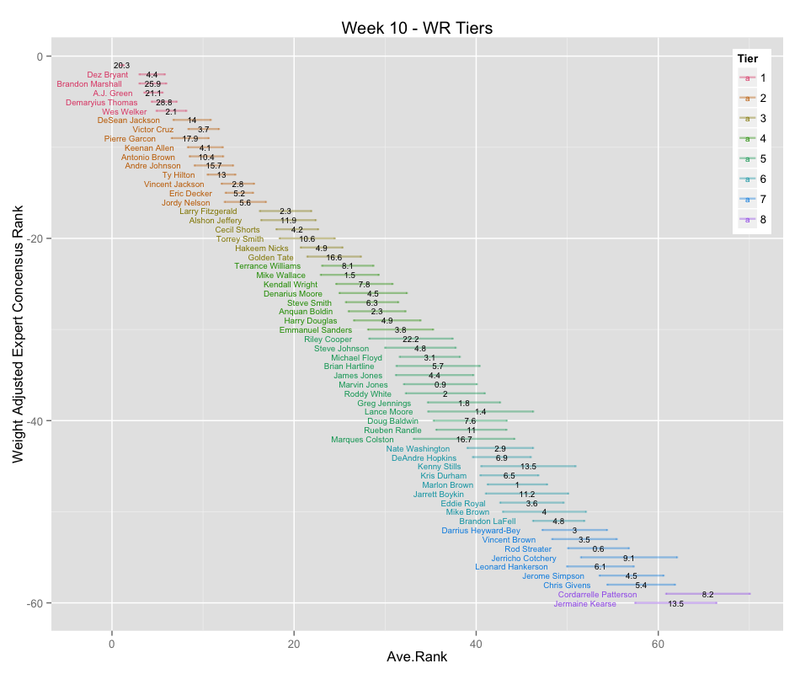 It was a bad week for a handful of tier 1/2/3 WR's, but on average the tiers still held true. Within a high tier, we expect most (not all) players to score highly. It's worth noting that without the two tier 8 monstrosities, WR tier accuracy would have been absurd. 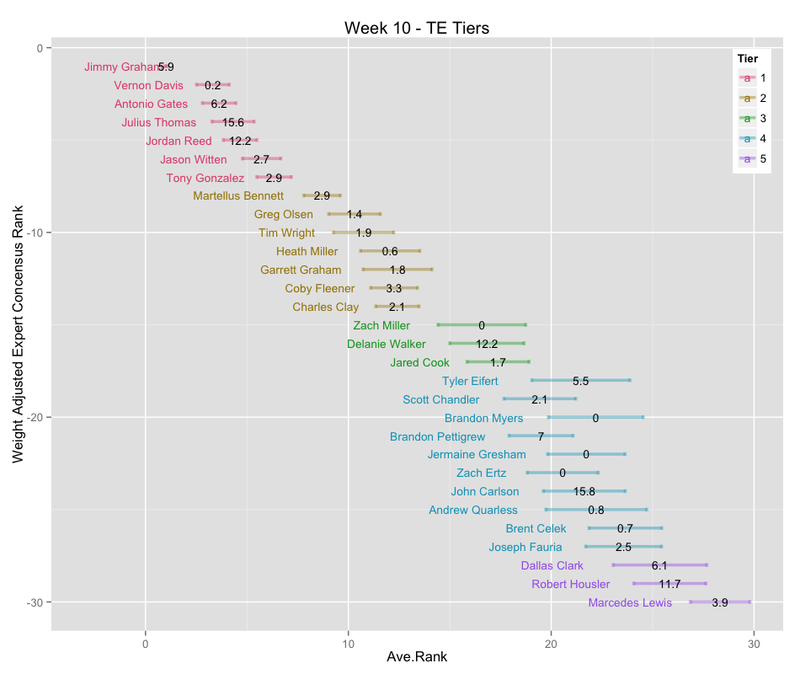 This was an extremely low scoring week for TE's across the board, though tier 1 did noticeably better. TE has been much more noisy than I anticipated all season long. 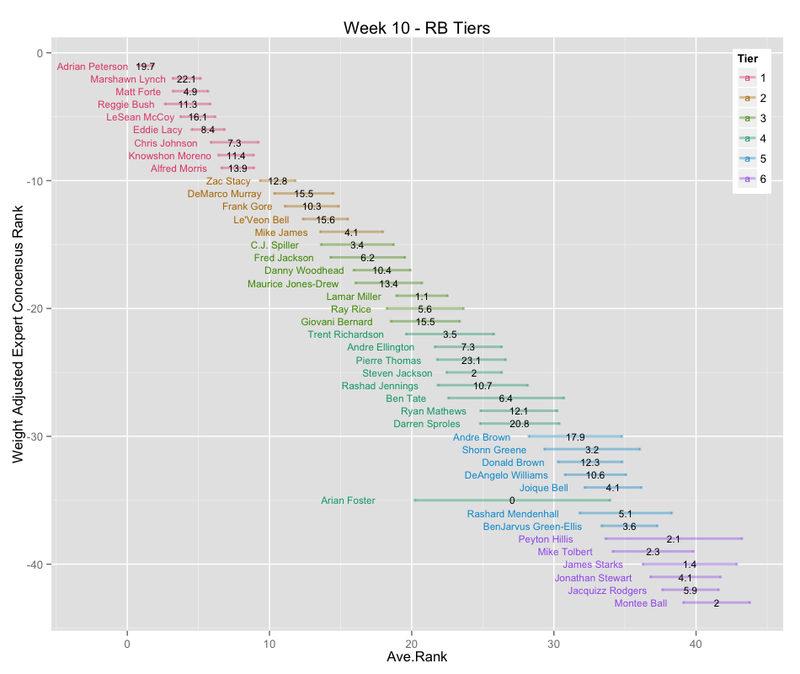 I've been attributing this to the fact that a higher percentage of TE points come from touchdowns (compared to WR and RB). 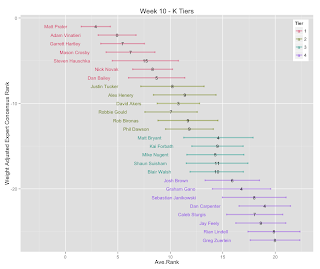 The lowest accuracy of the week, no surprises. Kickers have been the most noisy every week. The second lowest accuracy of the week. Also not surprising. 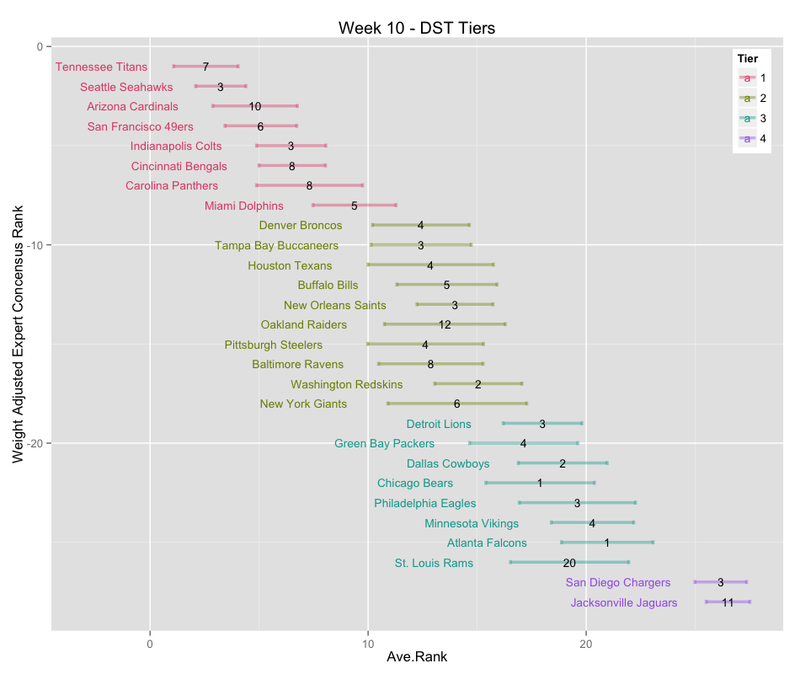 This is quite strong evidence for supporting streaming K and DST.